Our friend Glenn had taken over as head chef at the Brewhouse in Whistler, and so – given that it was also the middle of the skiing season – it seemed like an excellent excuse to go and visit. Glenn was working when we arrived, but introduced us to Dave the brewmaster, who took some time out to give us the tour of the brewery. However, when he realised that we enjoy quality beer as much as he does, he sat down with us as we sampled his creations, including a sneak preview of his upcoming and excellent 10% barley wine, until finally he had to call it a night and go to bed. We stayed on, though; both Bronwyn and myself had fallen in love with his excellent premium lager, Lifty, and besides, we had worked up an appetite. We were shown to a table on the mezzanine level, with views down into the kitchen where we could see Glenn and his staff hard at work. Its a big restaurant, and very busy, but the action in the kitchen was a dream of smoothly choreographed cooperation. It was a real pleasure to see the maestro at work, and especially interesting to watch our plates make their orderly way along the line – first an enormous stack of chicken breasts, then a pile of beef ribs, some vegetables – until Glenn added a few last artistic touches and sent it on its way up to our table. We attacked it with gusto, washed down with the last of our Lifty and then some fine wine, before staggering satiated and happy out of the door. Thanks, Glenn. 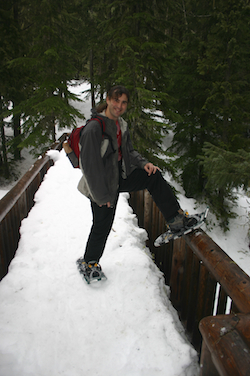 I had never been snow-shoeing before, so Bronwyn and I hired a couple of pairs to hike the trails around Lost Lake. I was very interested to see how they worked, and in the event they were deceptively simple. 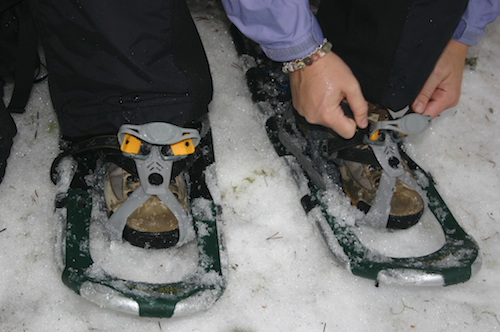 The lightweight aluminium frame clamped easily to my ordinary walking boot, providing me not only with a large surface area to walk on, but also four sets of crampon teeth. It took me a moment or two to get used to the rolling gait engendered by my newly acquired extra-wide feet, but after that I discovered that I was invincible; I could walk over anything! Although the trail itself had been groomed by the tracks of snowmobiles and the snow shoes and skis of previous users, the surrounding forest was waist-deep in soft powder, and I took every opportunity to head off the path and bound about on top of the drifts. It was like four-wheel drive for feet. We had started our trip in a gentle drizzle, but as we climbed higher up the mountain, the rain turned to snow. Before long we were gliding completely alone through a winter wonderland of fresh powder and frosted trees. The only sound was the soft crunch as our snow shoes dug in. We had left the main ski trail and were hiking on a narrow winding path amongst the pine, cypress and birch. On the occasional down-slope, we sat down and slid on our backsides, laughing like kids. We were twelve again, and the whole mountain was our playground. Eventually we came out on the frozen shores of Lost Lake, where a log cabin welcomed us with a merry gas fire as we stripped off our ski gear and unpacked our bread and cheese onto a convenient wooden table. Since it was Valentines Day, we opened a half-bottle of wine, and sat and marvelled about how perfectly wonderful it all was. Apart from one passing ranger, there was still nobody there but us and the lake and the silent forest. Note to self. Must go snow-shoeing again. This entry was posted in Americas, Canada, Travel on 2007/02/21 by Reinhard.